Running The Race Before Us: My One Word for 2015 AND My first giveaway! My One Word for 2015 AND My first giveaway! 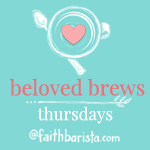 We’re launching our first Beloved Brews Linkup. Let’s become the Beloved in 2015. Writing intentionally with Jesus — with our whole heart. Every Thursday here. As soon as I read the above question, that word popped into my head. Joy. I have already blogged about my need to slow down and look for joy in a post about my New Year's Resolutions, and lately, God has been teaching me how to do this. Matthew 25:23 "Well done, good and faithful servant! You were faithful over a few things; I will put you in charge of many things. Share your master's joy!" Jesus wants me to share His joy! Each day is filled with His joy, but I have to learn to slow down, look for it, and take hold of it. I know He wants me to have it; He died so I could have it! Romans 15:12-14 And again, Isaiah says, "The Root of Jesse will spring up, one who will arise to rule over the nations; in him the Gentiles will hope." May the God of hope fill you with all JOY and peace as you trust in him, so that you may overflow with hope by the power of the Holy Spirit. Slow down. Enjoy rest. Trust in Him. Give Him your worries and fears. Be obedient in this. That's how you find and obtain joy. Look for the joy in the journey. It's there. He's there. Grab Joy! Put down the smartphone and talk to the person beside you. Put aside the day's tasks to play with your children a few extra minutes. Push away your worries and fears. Rejoice always and pray without ceasing (1Thess. 5:17). Push to embrace whatever the day holds for "this is the day the Lord has made; rejoice and be glad in it!" (Psalm 118:24). Slow down and enjoy the race of life. It's not a sprint; it's a marathon - pace yourself, take breaks, stop and drink when need be. No worries. You can do this! For joy, He did it. For joy, you can do this too! Hebrews 12:2 For the joy set before Him, He endured the cross, scorning its shame, and sat down at the right hand of the throne of God. Today's forget-me-not: Take the time to enter into the joy of the Lord! Thank you, Bonnie Gray, for inspiring so many of us to make more room for Jesus in our lives! And to express my gratitude to you for your efforts, I want to host my first blog giveaway. I want to give away a copy of Spiritual Whitespace! 1 - Log in using the rafflecopter below. 2 - Complete one or more of the activities listed on the rafflecopter. 3 - After you complete an action, click to submit an entry into the raffle via the rafflecopter. 4 - Complete all four activities to get multiple entries in the raffle! 5 - Come back to Forget-me-not, Oh Lord on Monday (1/19), and I will announce the winner by noon that day in the comments section below. I will also announce the winner on Facebook and Twitter. Contest goes from Friday, January 16 (12:00am) to Monday, January 19 (12:00am). Suzy Lolley is the giveaway winner! Congratulations! !